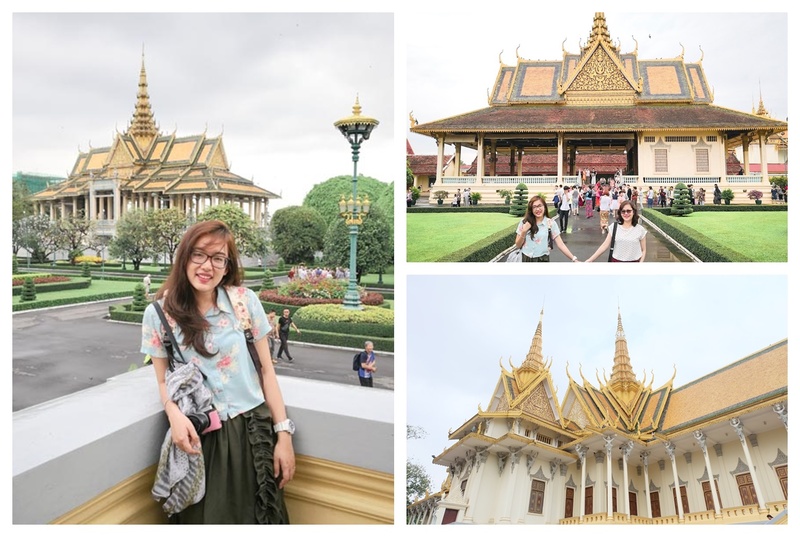 This 2018, I started my international travels with a flight to our neighbor Southeast Asian countries – Vietnam & Cambodia. And before you even say “Aren’t those countries look like Manila?”, I’ll answer you with a big YES! After almost a week in Viet-Cam, I witnessed how their cities are less advanced than Manila and how the locals look like Filipinos too. So before you even start your trip to Indochina, I challenged you to shift your focus on this countries. Focus on their rich history and culture. Focus on their architecture and majestic temples. Focus on their food and extra good coffee. And most of all, focus on the people you’ll meet on your journey. And when you do, you’ll definitely love it. Plus, it’s cheap! It was only in my trip that I learned that Indochina originally refers to the colonies, consists of Laos, Cambodia and Vietnam, of the French empire before. But now it is referred to be as the “Mainland Southeast Asia” and the land historically influenced and bounded by India (in the west) and China (in the north). 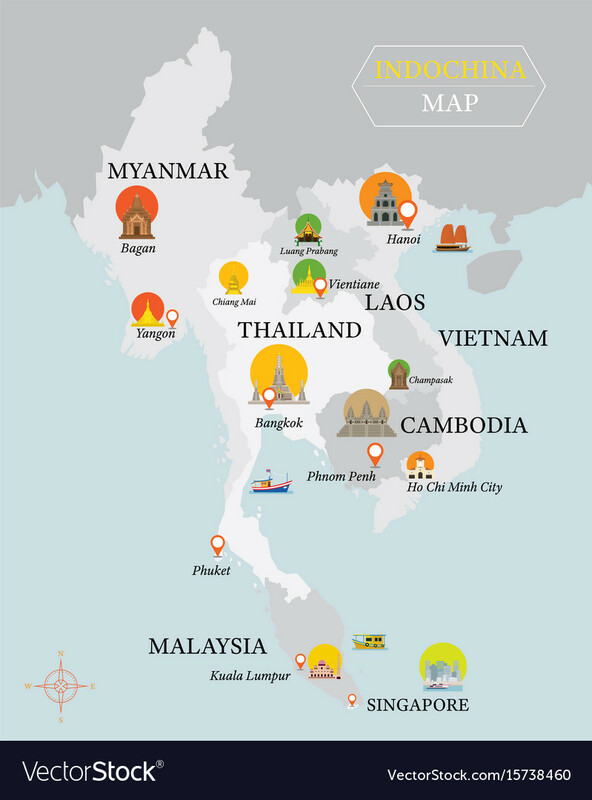 Indochina now consists of Myanmar, Thailand, Laos, Cambodia, Vietnam, Malaysia and Singapore. It is very common for travelers to visit multi-cities when heading to the Indochina region for months. 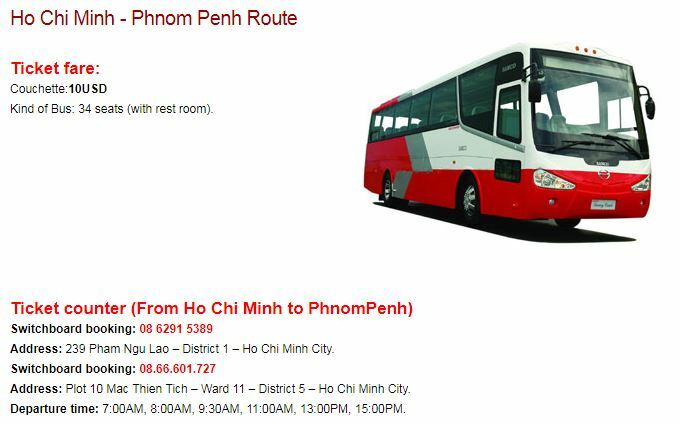 But the famous route would be the Thailand – Cambodia – Vietnam by bus for 7-10 days. Since I’ve been to Thailand before, I decided to just explore Vietnam and Cambodia. First thing you need to do is decide where to start and end so you’ll be able to know where your entry point and exit point are. 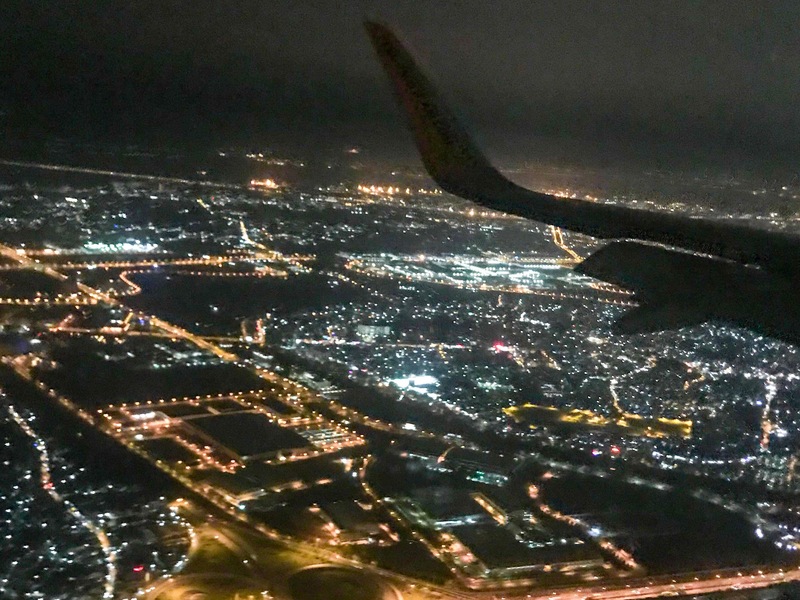 I booked a multi city flight from Manila to Ho Chi Minh & Siem Reap to Manila via Cebu Pacific for 6,200 pesos, three months before the travel dates. P.S. You can also check the other way around to compare airfare prices. 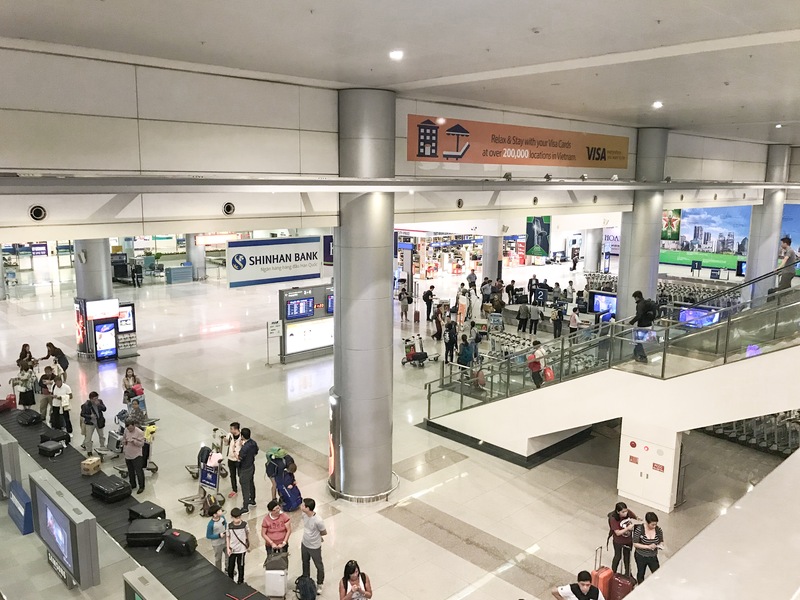 There are only two airlines – Cebu Pacific and Philippine Airlines – who offer direct flights from Manila to Ho Chi Minh, Vietnam. While only Cebu Pacific offers direct flight from Siem Reap, Cambodia to Manila. There are no morning flights available in Cebu Pacific to Ho Chi Minh, Vietnam. Most of the flights are 10 PM but there are days where they offer flights as early as 7 PM. Travel time is almost 3 hours but Vietnam is one hour delayed than Manila. Their airport is called Tan Son Nhat International Airport which is a lot like NAIA. Lakas maka Terminal 3 diba? 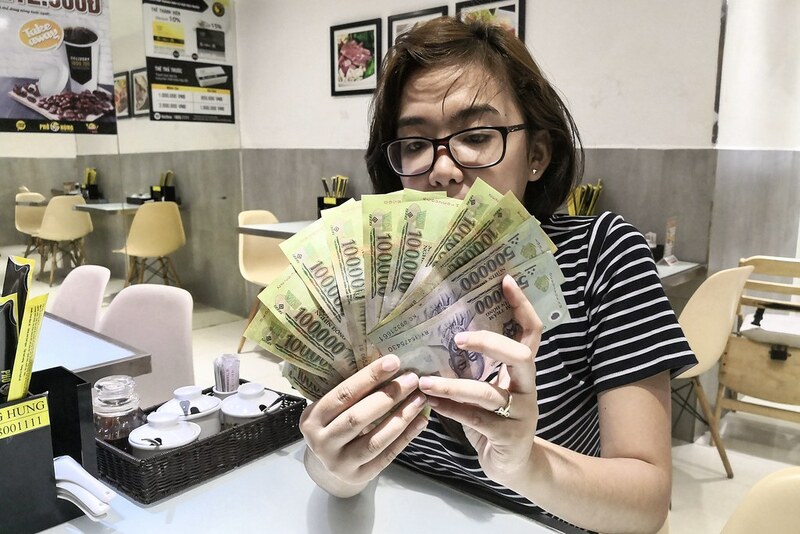 We took an Uber to our hotel since it will only cost us around 100,000VND (~200PHP) and also to save us from the hassle of our luggage and taxi scams. I booked our hotel through Agoda for 5,700PHP for 3 nights. 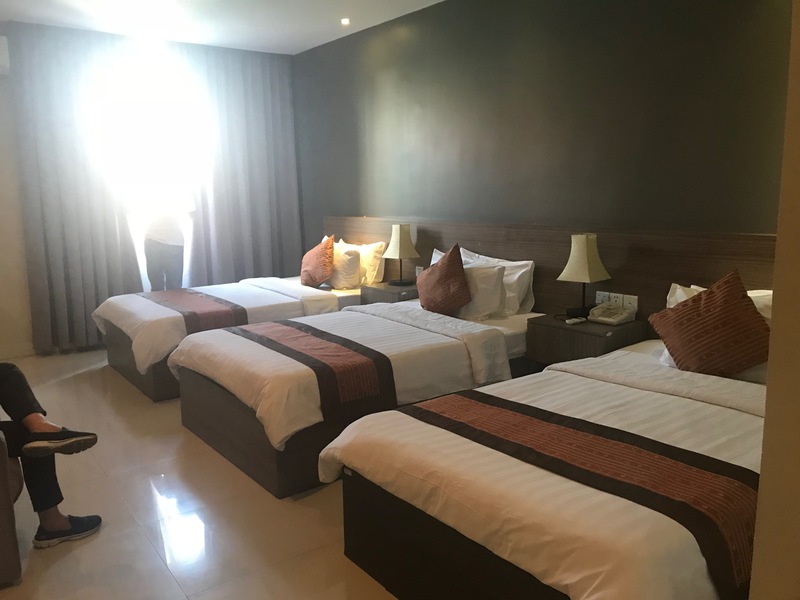 The hotel is nice, near the backpacker street Pham Ngu Lao and 5-10 minutes walk to the city attractions. 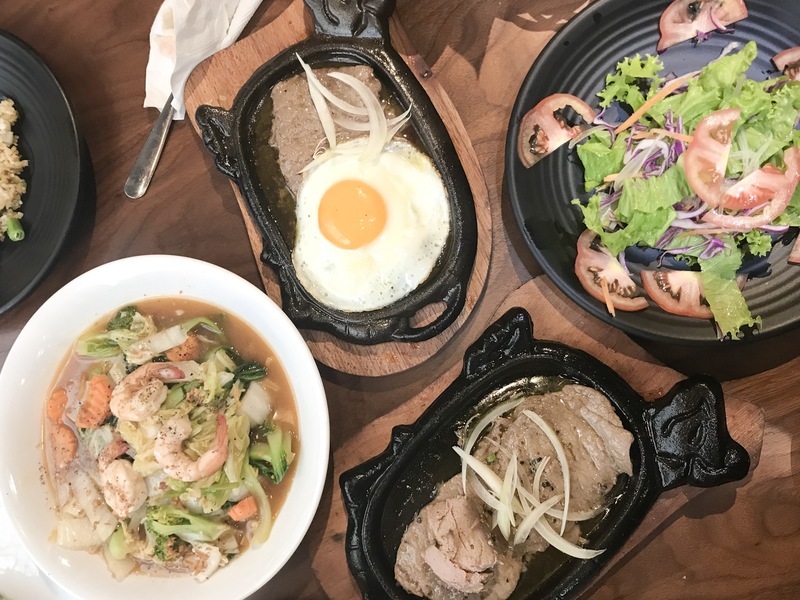 10:30 PM – Find a place to eat in Pham Ngu Lao Street. Our hotel has a free breakfast buffet. It is nothing big but enough to start our day. Restaurants are still not open at 7 am but cafes do. Oh, don’t forget to try their coffee! We started our city walking tour with Reunification Palace. 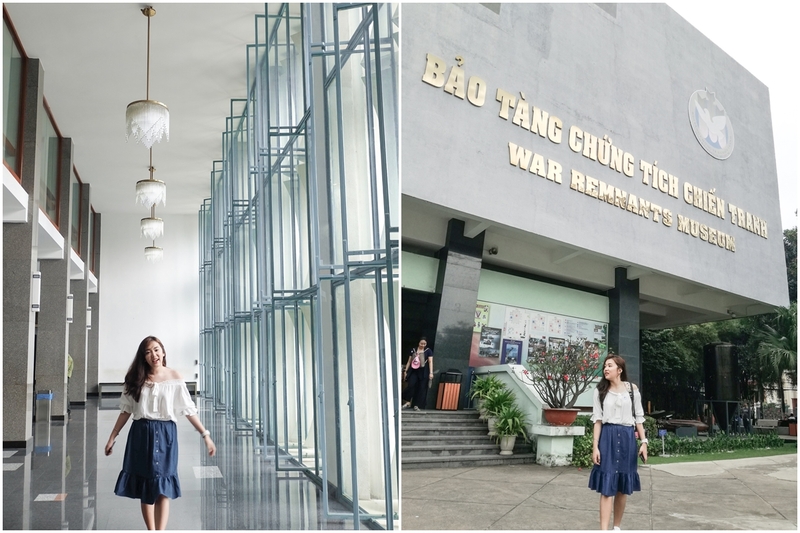 It is a government palace that serves as home and workplace of the president of South Vietnam during the war. The place is more on history and he different beautiful rooms of a palace. 10 minutes walk away from Reunification Palace is War Remnant Museum. As the name implies, this is a museum of photos and tanks used during the Vietnam War. This place is heartbreaking so prepare your heart. Finding restaurants around is easy. We found this cute cafe near the War Remnant Museum. Prices are almost the same with Manila’s. Each dish will cause you around 90,000 VND (~200 PHP). If you’re on a tight budget, there are some carienderias around. The basilica is under construction when we visited (and I heard it will be completed on 2020, correct me if I’m wrong). You can’t enter so there’s nothing much to do but admire it outside. Beside Notre Dame is the post office. One famous thing to do here is to send yourself or your friends postcards from around the world. There are souvenir shops as well inside. Sending a postcard to the Philippines will cost you around 300 PHP. P.S. I made a mistake by going to War Remnant Museum first. It is better to visit Notre Dame and the Post Office in the morning after Reunification Palace to avoid the afternoon heat. Then spend the afternoon indoor in War Remnant Museum. Nguyen Street is a walking street where the French colonial architecture is still visible. 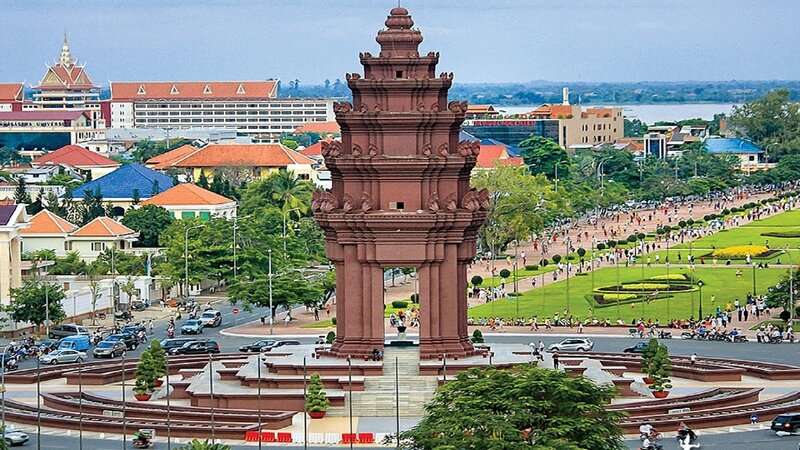 You can see here the City hall, Ho Chi Minh’s Statue, Saigon’s Opera House, a good view of Bitexco Financial Center and lots of cafes and fashion stalls. If it’s too hot for you, then go chill on Apartment Cafe. Unfortunately, Ben Thanh market closes around 5 PM. Went inside for 30 minutes but the place is chaotic and humid. There’s fresh meat, fruits, souvenirs and bad quality bags inside. If you want to shop, then head to Saigon Square. The clothes are nice and you can buy class A Kipling and North Face bags. It is a lot better than Ben Thanh. We went to Saigon Square 1, just near Ben Thanh. 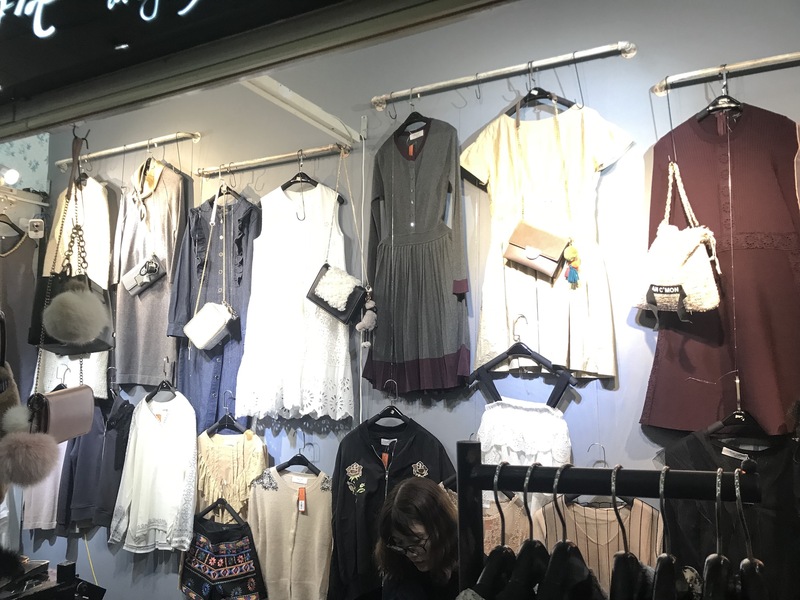 Clothes starts from 150000 VND. Around 9 PM, the street beside Ben Thanh Market is closed to give way to the night market. It is a lot better than the market itself. There are street foods, souvenirs, and clothes around. It reminded me of Khao San Road in Bangkok. 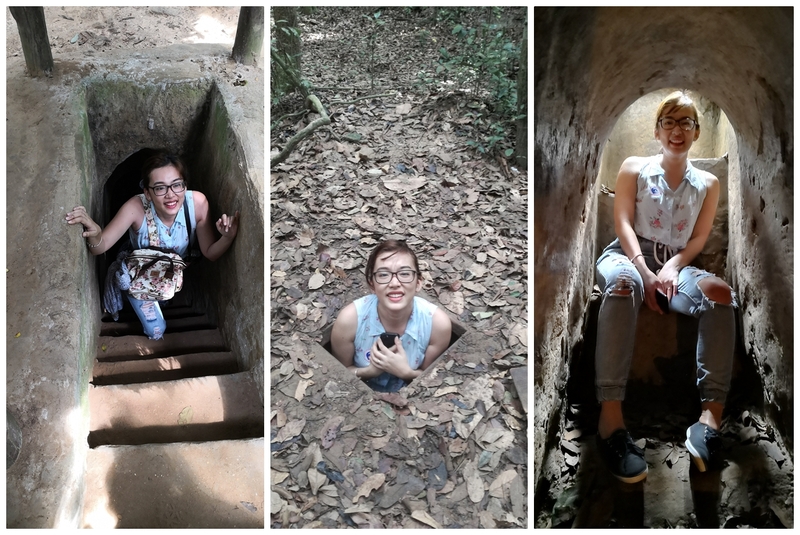 I book a half day tour Cu Chi Tunnel Experience via Klook for only 673 PHP. Cu Chi is almost 2 hours+ away and it is somehow hard to DIY it. Meet up is in De Tham Street, in front of Starbucks Coffee and mostly the place where there’s a swarm of people. Tour starts on time so avoid getting late. 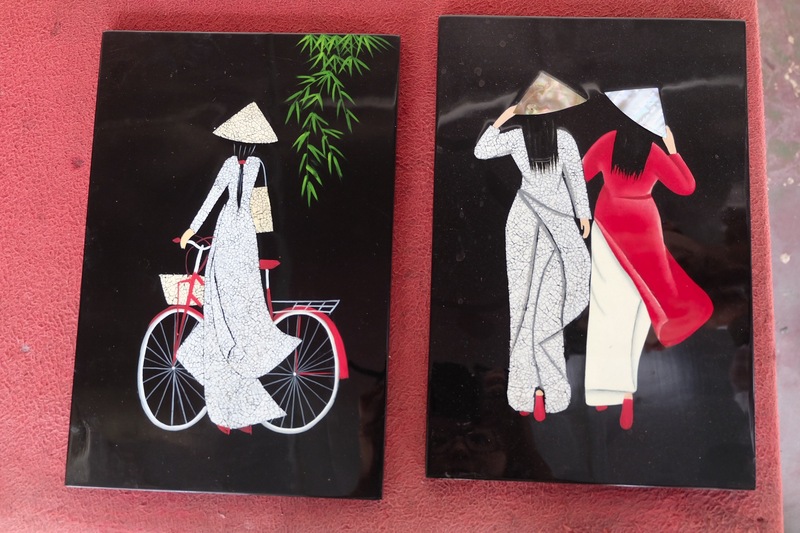 We stopped by a showroom of the artworks of the victims of Agent Orange*. 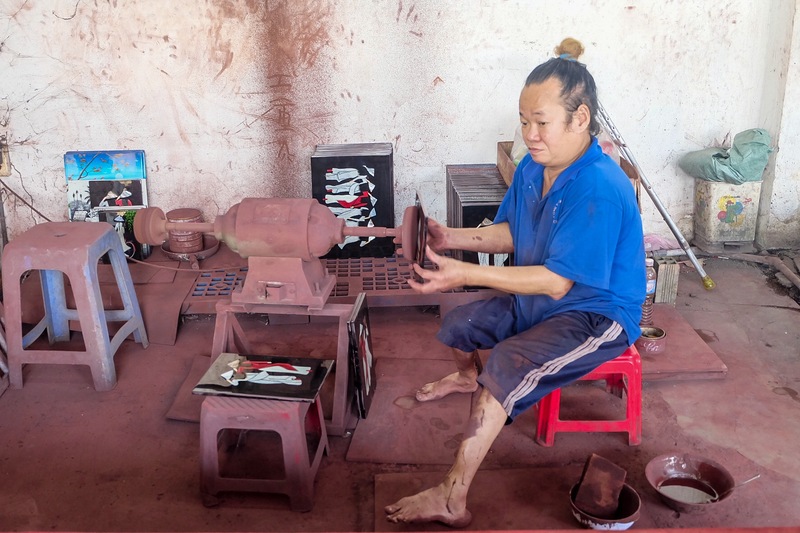 You can buy the beautiful arts they produced to help them with their medical bills. *Agent Orange is a powerful herbicides that the US Military used to the Vietnamese during the Vietnam War. It has a lot of medical effects that are still experienced by the 2nd generation Vietnamese. He’s a second generation victim of Agent Orange. The artworks the victims make to have money. If you are a fan of guns then you’ll definitely enjoy the first stop. You can fire machine guns, M16s, AK47s, and other more. You just need to buy the bullet that cost around 35,000 VND each (minimum of 10). I was not able to get inside the firing range because the sound is too much for me. I chose the viewing deck. 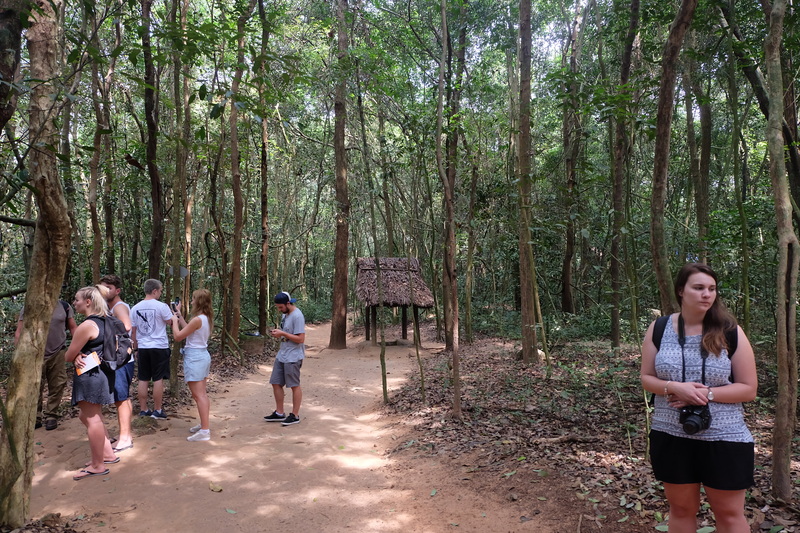 Since we booked a tour with Klook, we already have a tour guide to guide us in the forest. The history behind the tunnels is interesting, fascinating and heartbreaking at the same time. The highlight is crawling the tunnel yourself. If you are claustrophobic, then this will be a big NO for you. The tour is not actually a half day. It almost took a whole day since we arrived in HCM around 4 PM already. Mekong Express Bus is what we availed of our trip. It only costs us 12 USD/each inclusive of water, bread, & a guide that helped us in the Vietnam-Cambodia border. Here’s the schedule. Before arriving to the border, the guide will collect all your passports in the bus. You’ll be asked to get out of the bus and wait for your guide to submit your passport in Vietnam’s immigration officers. After your passport has been stamped, the bus will take you to Cambodia’s immigration office (only 3 minutes away). Again, you need to get off the bus and line up individually for your arrival stamp. Cambodia has a visa on arrival for 30 USD. If you are from a Southeast Asian country, the visa is free. P.S. Beware of buying sim cards outside the Cambodia borders. Look for Cellcard’s booth for legit ones. Travel time is 6 hours+ depends on the traffic and how busy the border is. Don’t worry about lunch since Mekong have a 20 minutes lunch stopover. Phnom Penh streets are scarier than Ho Chi Minh’s. Take care of your belongings and prefer to use Uber/Grab. I booked a triple room in Asia Tune Hotel via Agoda for 2,500 PHP and I didn’t expect for a nice room for such price. It is also near the Royal Palace. 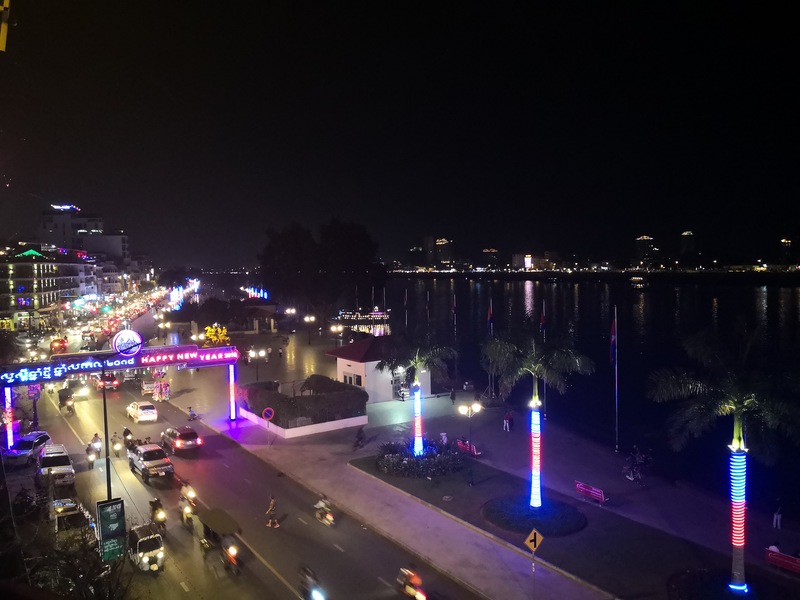 There are a lot of restaurants near the Mekong River. We tried Khmer Saravan Restaurant for authentic Cambodian food. Asia Tune offers a complimentary breakfast. So much love for this hotel! Ask you tuktuk driver to drop you in the Independence Monument for some photo ops. I was able to score 30 USD flight to Siem Reap via Cambodia Angkor Air. It is almost double of the 15 USD bus fare but I don’t want to waste another 6 hours on the road. P.S. Cambodia Angkor Air domestic plane is seriously dirty! Siem Reap seems like a different country from Phnom Penh. It is safer, cheaper and has the countryside vibes. Again, I booked Rithy Rine via Agoda for 6,200 for 2 nights inclusive of breakfast and roundtrip airport shuttle. 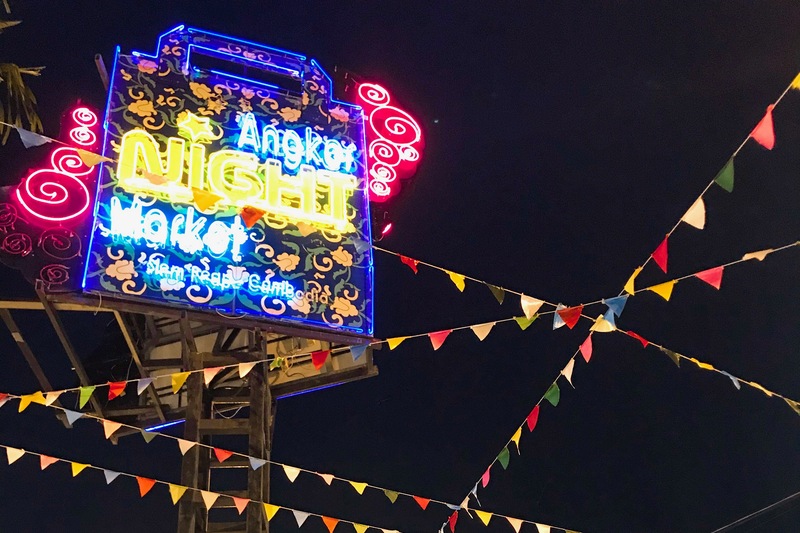 One good thing with our hotel is it is only a walking distance to Angkor Night Market & Pub Street. Dinner is a little expensive here starting from 5 USD but carienderias are also around. If you are going shopping, haggle! We hired a tuk-tuk via our hotel (8 USD) to take us to Angkor Wat to watch the sunrise. We were driven first to the ticket office. 1 Day Pass costs 37 USD (~2,000 PHP). We chose not to see all the temples (only the famous ones) to be able to squeeze it on one day. Our tuktuk drove us back to our hotel for breakfast and to wait for our Angkor Wat Tour Exploration with Klook. 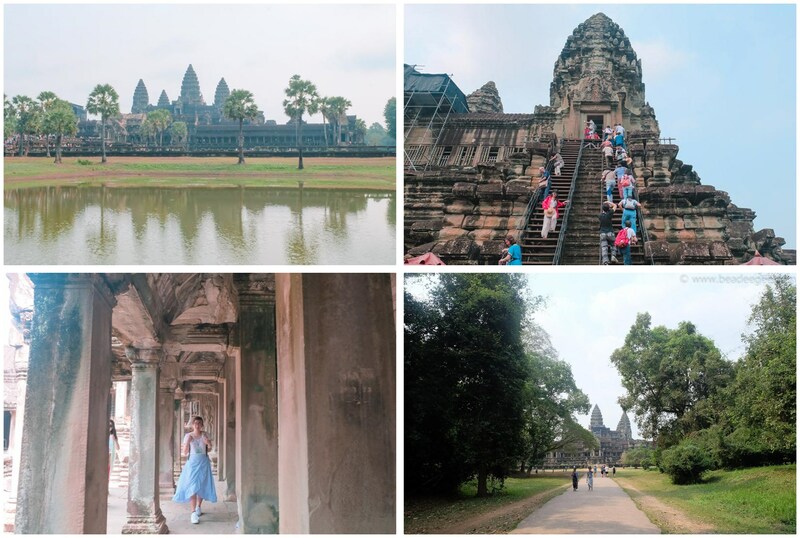 We decided to book Klook’s Explore Angkor Tour to maximize our day pass and for the inclusive tour guide. Klook picked up at our hotel at 8 AM and started our temple run with Angkor Wat. If you travel for good photos then I advised you to just rent a tuk-tuk because this tour can be a little fast phased. 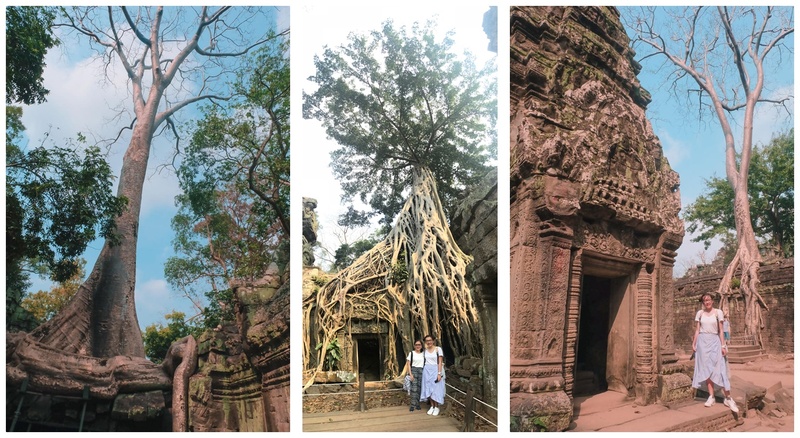 Another famous temple in Siem Reap is the Ta Phrom or commonly known as the Tomb Raider temple. This is where most of the scenes in Tomb Raider were filmed. If you booked via Klook, lunch is exclusive so you need to pay at your own expense. The restaurant they brought us is a little upscale so be prepared. My order is around 8 dollars. Besides Angkor Wat complex is Angkor Thom. It also consists of different temples with Bayon as the most popular. It is the youngest of all temples and also known for its smiling faces. Can you see the smiling faces? The last stop will be Phnom Bakheng to watch the sunset. There’s a 10-minute hike to the top of the hill and another queue to the top of Phnom Bakheng. We were so tired of the whole day temples exploration. Seriously, you will too. We already checked out of our room but we left our bags in the reception so we can explore Siem Reap. 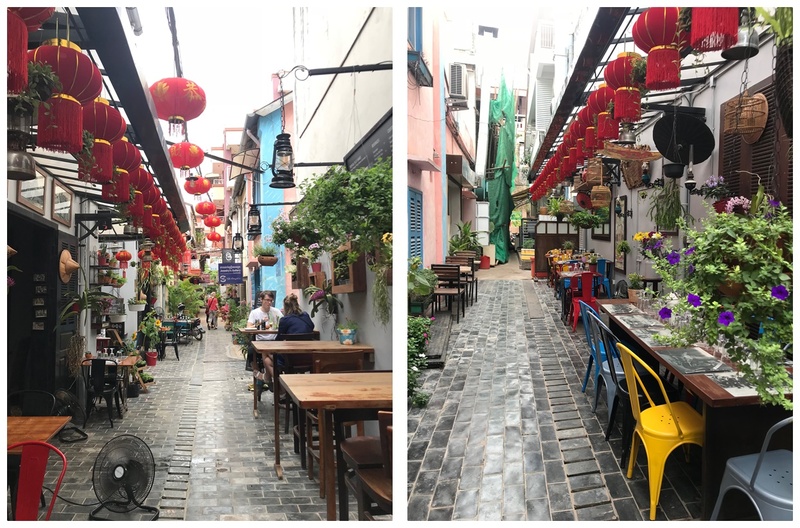 We stumbled upon this cute alley by accident and discovered the restaurants and shops along it. We ate our lunch in one of the restaurants here. 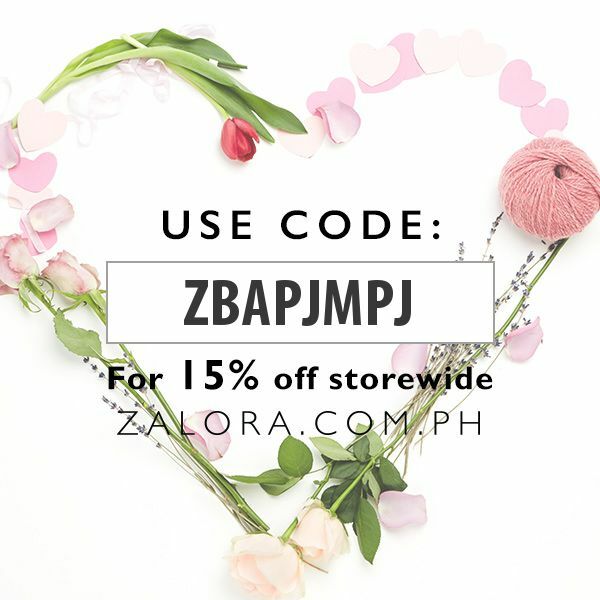 We shopped for our pasalubongs here. But Angkor Night Market has more to offer so you can choose to chill or swim in your hotel instead. Prices are cheap but still don’t forget to HAGGLE! Our hotel has a complimentary drop off at the airport. Cebu Pacific is the only airline that offers direct flight to Manila from Siem Reap. Flight is usually late at night. This itinerary is overpriced for the backpackers’ style travelers. This is more suitable for travelers who prefer comfort or for those who have kids and parents in tow. I chose to splurge a little for our accommodation. There are other cheaper choices. It is advisable to bring US Dollars in your Indochina trip. I bought my sim card (Vinaphone) in Ho Chi Minh via Klook. It only cost 234 PHP for 2 GB data & local calls. It will also be delivered to your hotel which is a good thing since I don’t have enough time to look for telco stores. In Cambodia, I bought a sim card (Cellcard) outside the border for 5 USD for 3 GB. The weather is the same with the Philippines. There’s hot and very hot. The best months are December to February since rainfall is minimal and the temperature is lower than summer months April-July. How many days should I allot for each country? We only have 2 full days in Ho Chi Minh and it wasn’t enough. 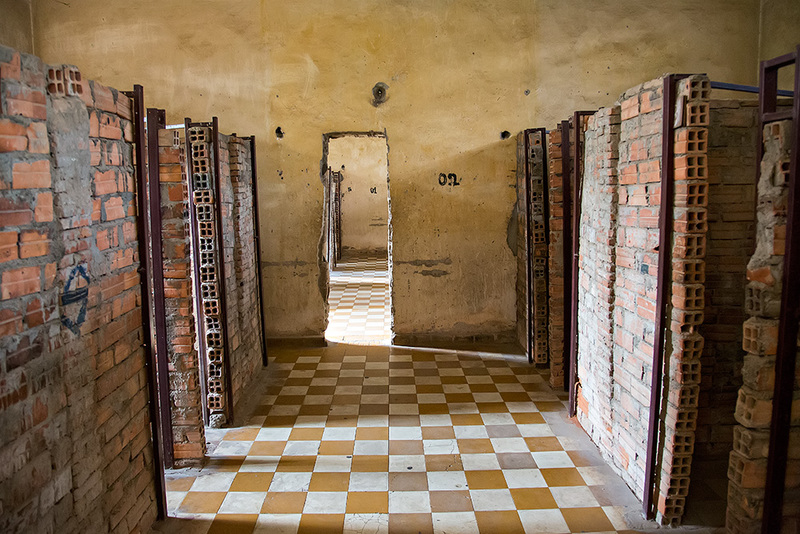 If you wanted to see the city, Cu Chi tunnel & Mekong River, then 3 full days is advisable. 24 hours in Phnom Penh is enough. While in Siem Reap, it will depend on your budget. There are a lot of temples and it will require 3-5 days to see them all. 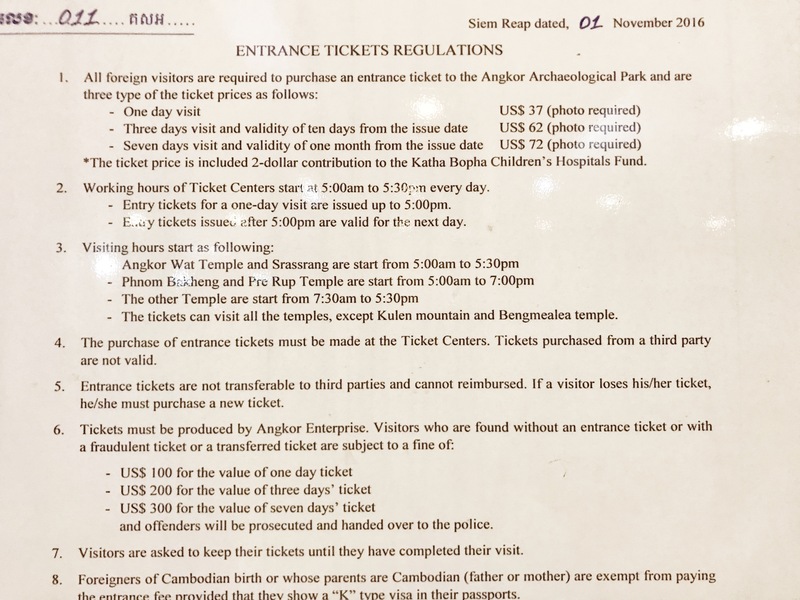 So the question will always be how much are you willing to shell out for the Angkor Day Pass ($62 for 3 days; $72 for 7 days)? Next question will be, how many days are you willing to walk hundred of step? Clothes are almost at the same price here in Manila. North Face products are the best buy on Vietnam since even their class A are in good quality and price. Cambodia has good quality sarongs and scarves. In terms of food pasalubongs, they only have dried fruits. There are two ways you can travel to Cambodia from Vietnam – by bus or by plane. Plane tickets can cost you around 150 USD one way. If you’re willing to spend that much money, then book your ticket with Vietnam Airlines (Phnom Penh & Siem Reap entry) or Cambodia Angkor Air (Siem Reap entry only). If you want to save some money, then let’s stick with the bus. 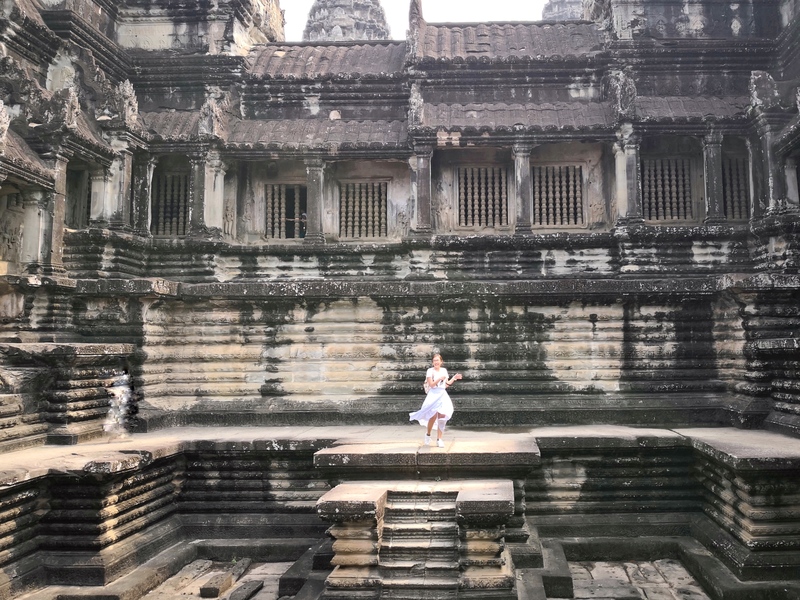 Amidst all the blogs and scams I’ve read online, I felt safe on Ho Chi Minh and Siem Reap. But keep in mind to be still alert. Their money is confusing so avoid showing it to the vendors or drivers. They usually tricked tourist of getting the different value (e.g getting 100,000 bill instead of 10,000 bill). I’ve also heard a lot of scamming incident with habal-habal drivers offering you a city tour. Try to stick with Grab or Uber. Phnom Penh, on the other hand, is the opposite. I felt like that someone will just grab my bag and phone even at noontime. Our tuk-tuk driver even warned us. Before, I thought that Vietnam and Cambodia are the countries I’ll only be going once (the Philippines has a lot more to offer they said). I never saw myself enjoying these countries and thinking of going back someday. But I did. And I hope you will too. 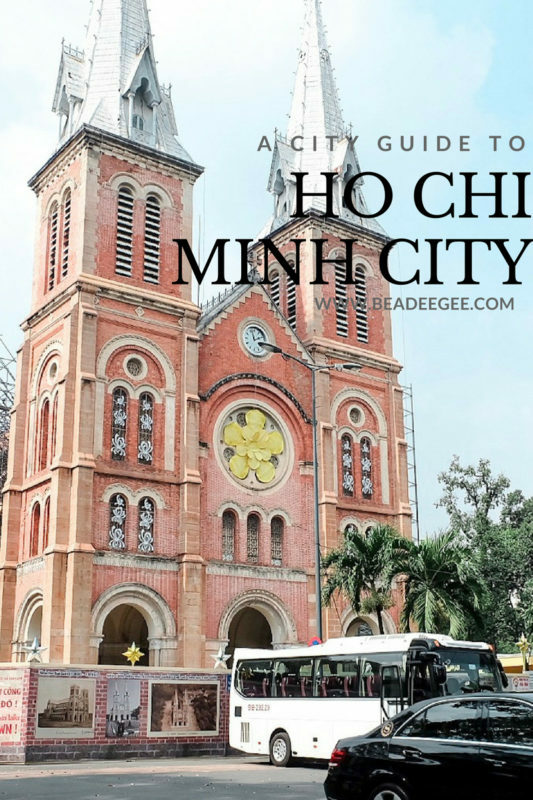 Heading to Ho Chi Minh soon? Click the image on the left for a detailed island travel guide that will help you more. We can share tips, experience and guides in the comment section below! I have done a small Indochina tour before but the countries I visited are Cambodia and Thailand. I’m going to Vietnam in a few months time, so thanks for sharing this! I’m kinda excited for the trip because I heard Vietnamese food is so good! 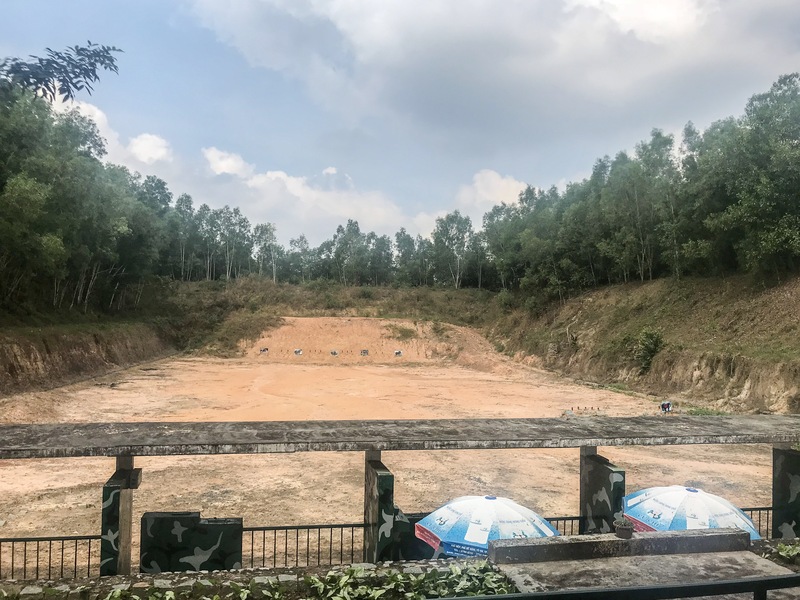 I am also looking forward to visit Cu Chi Tunnels and the War Remnants Museum as I am really fascinated by war. Weird, I know. Lol. I’ve visited Vietnam, this is a quite nice place. Hi! Your travel guide helped me a lot in planning my family’s December Viet-Cam trip. Thanks a lot for this. 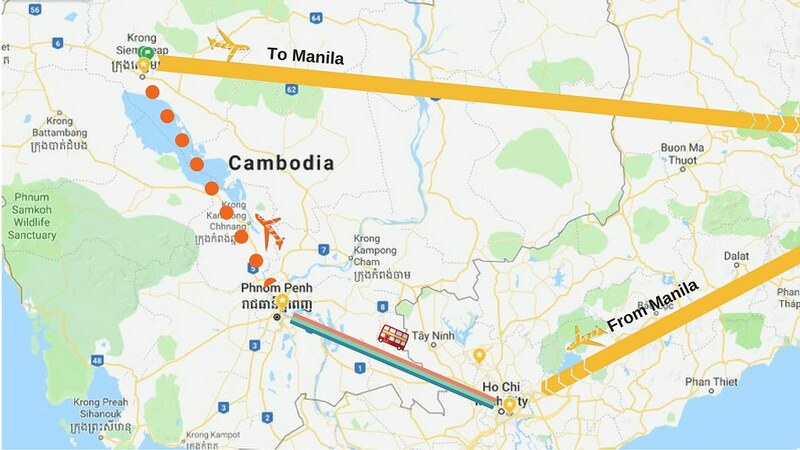 Just want to ask how were you able to get the 30 dollar airfare from Phnom Pehn to Siem Reap?